The large scale spiral structure of the Galaxy is affected by the complex distribution of cavities, filaments, arcs, loops and shells, often refered as the "Cosmic Bubble Bath". First examples of such features were found in radio continuum measurements, extended to high galactic latitudes (Loop I, II and III). Later anomalous HI features like worms, chimneys and supershells were identified and catalogued. Similar morphology has been recognized in some nearby spiral and irregular galaxies (M31, M33, LMC, SMC). The most studied galactic shells are formed by supernova explosions and winds of massive stars. 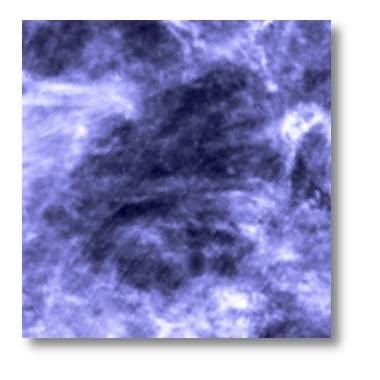 High velocity clouds may also form large cavities when infalling from the halo, however observations suggest, that most of the HI shells are related to star-formation, rather than to the infall of HVCs. Gamma ray bursts may also be responsible for the formation of the largest supershells and nonlinear development of instabilities in the interstellar medium may from large cavities without stellar energy injection, which can be very similar to those created by SN explosions or stellar winds. These shells/loops may also provide a nest for the next gerenation of stars via the process of propagating star formation. The cavities of the interstellar medium contain low density hot gas in its multiphase model. The hot gas filling factor f is an important parameter of the ISM, which is poorly constrained observationally. Reliable estimates of f In our study we searched the whole sky for loops/arcs using IRAS based far-infrared data (a detailed description of the data reduction can be found here). This is the first study which is not restricted to the galactic midplane. Our catalogue contains the basic properties of 462 loops. Distance estimates are given for 73 of these loops, based on indicator objects (massive stars, dark clouds, supernova remnants, etc.). The catalogue and others results have been published in two separate papers (see the links below); Paper I -- the 2nd Galactic quadrant and Paper II -- the 1st, 3rd and 4th Galactic quadrants.